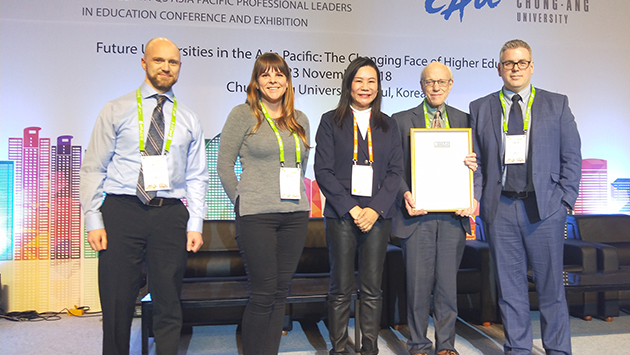 UFV reps receive the prestigious QS-STARS recognition at last week’s QS Asia Pacific Professional Leaders in Education (QS-APPLE) Conference in Seoul, Korea. Left to right: Max Nevill (Institutional Research & Planning), Holly Zonneveld (Advising Centre), Mandy Mok (CEO, QS Branding and Conferences by QS Asia), John Potts (manager, partnerships & programs, UFV International), and Dave McGuire (executive director, UFV International). 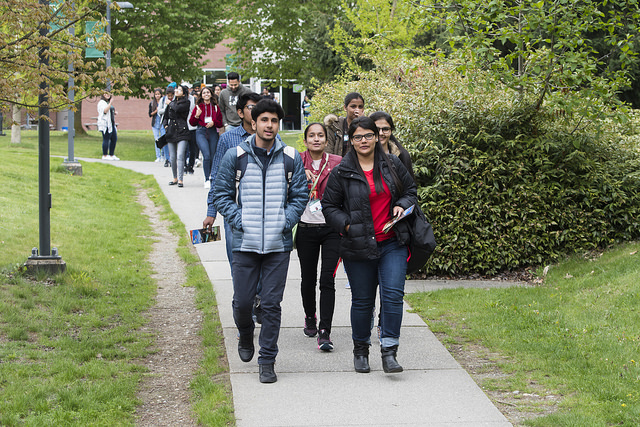 The University of the Fraser Valley has earned four-star status in a prestigious international post-secondary rating system that helps students choose the university that best fits their needs. While UFV earned a four-star rating, it received a perfect five stars in two key areas: teaching and employability of graduates. The QS Top Universities site (www.topuniversities.com) allows prospective students to take a detailed look at an institution, enabling them to identify which universities are the best in specific areas, such as programs, facilities, grad employment rates, social responsibility, and inclusiveness. QS Stars institutions are highlighted on this site. “QS Stars understands that universities are different to one another and therefore need to be assessed on a range of categories that recognize distinct strengths. It also recognizes that each student is looking for something different, and not all universities — even the highest ranked ones — suit every student,” notes the QS Stars website. Key personnel within UFV International and Institutional Research and Planning worked hard to prepare the detailed application package. John Potts, UFV International’s Manager of Partnerships and Programs, says that the new designation will help in the university’s relationships with overseas partners. International students at 2018 Orientation. Potts adds that the QS achievement will help UFV attract better qualified international students. With regard to student recruitment, the goal is not to simply increase numbers, but to recruit student who are assessing universities as they are academically prepared, which enables them to make choices, notes Potts. While the positive rating will help recruit international students to UFV, it will also help the university to build partnerships with universities around the world. These partnerships allow UFV students to take advantage of Study Abroad options and facilitate visits by visiting scholars. “This is truly a distinction that will give UFV visibility and recognition on the global stage. It will elevate the value of a UFV credential to our alumni as well as our current and future students. This is one of the most important milestones we’ve achieved in terms of getting international visibility,”says McGuire.